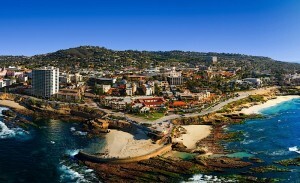 Located 12 miles north of downtown San Diego, La Jolla is among the most affluent neighborhoods in the United States. Surrounded on three sides by bluffs, beach and the Pacific Ocean, it is home to approximately 35,000 residents, as well as such renowned educational institutions as the University of California at San Diego, Scripps Institute of Oceanography and the Salk Institute. Downtown La Jolla is known for its upscale jewelry and clothing boutiques, restaurants, cafes and galleries. The enclave is also home to Torrey Pines Golf Course and Museum of Contemporary Art San Diego.